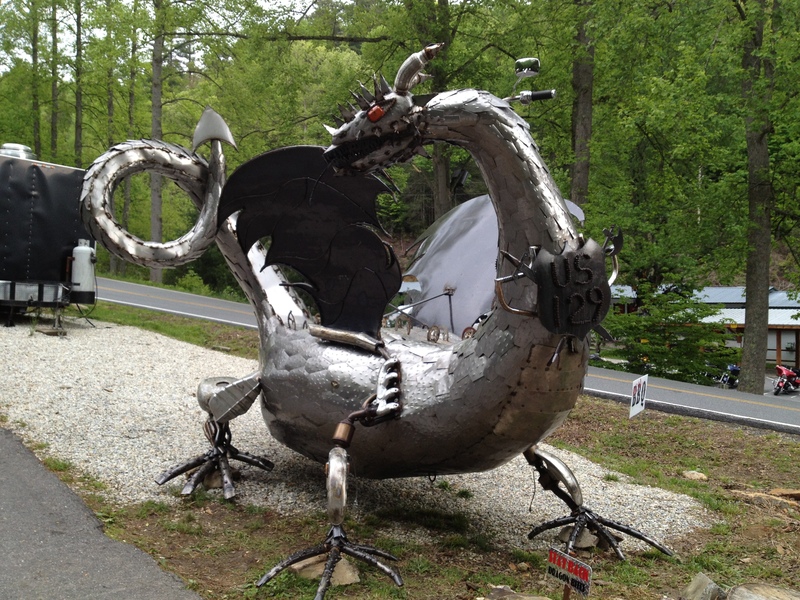 A few clear days gave an opportunity to ride the world-famous “Tail of the Dragon“, a road with 318 miles of curves in just 11 miles. But did my first time on this road have to be in torrential rain with near zero visibility…? I had just four days to get down to North Carolina, bang out some quality riding and be back by Friday evening for my son’s 13th birthday party. 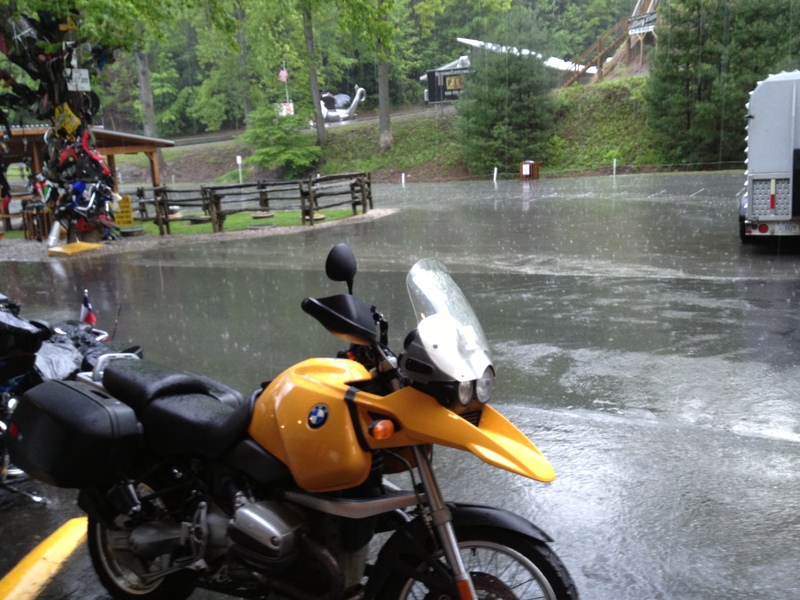 Shortly after starting the 800 mile ride south I ran into rain. Then came more rain, downpours, a deluge and then just a steady torrent which kept up until dark when I decided that this wasn’t any fun and it was time to find a motel. Finishing the ride on Wednesday morning I arrived at Deals Gap Motorcycle Resort by way of US 129 from Robbinsville wondering what all the fuss was about. US 129 was a nice road but nothing like the challenging wild ride I had heard so much about. I needn’t have worried – the really challenging part was yet to come. Pulling into the parking lot my senses were assailed a wild array of vehicles. 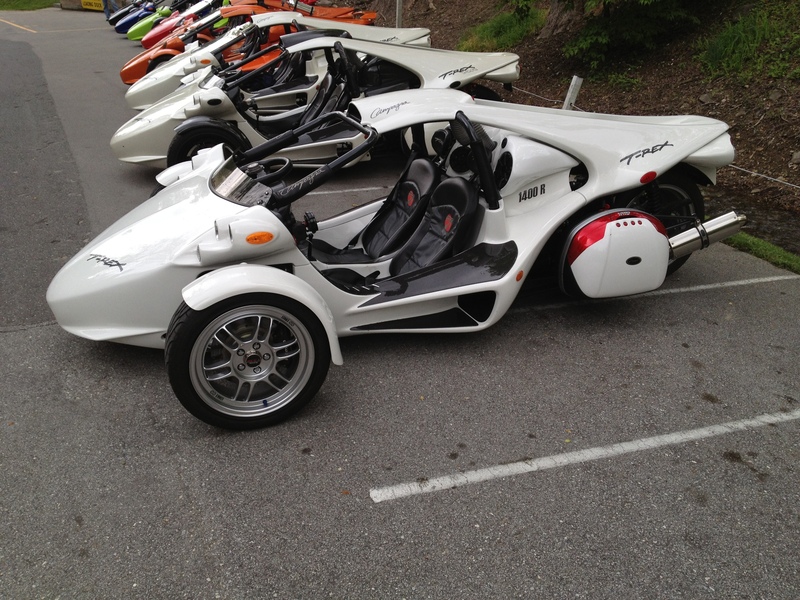 Every kind of motorcycle was in evidence, plus cool sports cars and some very strange-looking machines called a T-Rex, which I originally took to be an Arial Atom. Clearly this was a place for serious gear heads. I checked into my room which could best be described as ‘clean but basic’ (almost barracks like in its layout) and then, hearing people talk about possible rain, I decided to waste no time hitting the Tail of the Dragon. I’d seen video and pictures of the dragon before but they really can’t do it justice and it was immediately clear how this road obtained its name. Not only did it contain a never-ending series of turns but the continually changing road camber really gave a feel of riding something that was undulating and alive. This being my first run I was taking it easy and working on taking the correct line and watching my vanishing points. Then, about 3 miles into the run out the heavens opened up with a downpour of biblical proportions. With the curtain of rain and a rapidly fogging visor I didn’t need to worry about the vanishing point anymore…it was about 6 inches in front of my nose! Seriously, the thought going through my head was “Here I am riding one of the most challenging roads in the world for the first time, in the pouring rain, and having to use The Force to figure out where the road goes.” I pulled over to let a fast-moving Corvette pass (the only other vehicle on the road) and then stayed with him until near the end of the outbound run, where there was a large paved area for turning around. On the reverse trip the rain was now complemented by rivers of water running across the road but the Corvette and I made it safely back and, despite the rain, I actually really enjoyed the ride and couldn’t wait to get back to it again. I spent the time back at the resort talking to fellow gear-heads until the sun came out and the roads started to steam steadily. Then it was back on the bike for two more runs including one that I extended around Chilhowee lake. That last one unfortunately took longer than anticipated and I arrived back at the resort 15 minutes after the restaurant had closed. Bummer! There is no cell service in this area at all so any checking in with the family involved an 18 mile ride back to Robbinsville. Fortunately even the ride to Robbinsville is on great motorcycle roads. In fact all the roads around Deals Gap are top notch twisties and the only real problem is if you are in a hurry to get somewhere. I spent the rest of the evening swapping jokes and moto related stories with my neighbors over a couple of beers. Everyone had plenty of experience, interesting stories and were eager go show pictures of the other classic/fast vehicles they had at home. I asked around and couldn’t find a single person that didn’t know how to drive a stick!